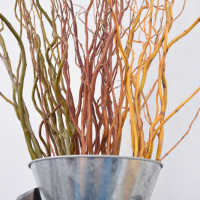 Curly Willow makes a fabulous addition to any floral arrangement, centerpiece, or craft project. Dried willow branches can be shaped for your specific needs. 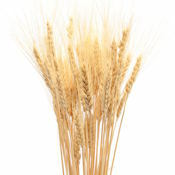 Simply soak the branches in warm water for a few hours until even the thickest portion of the stem becomes pliable. Curly willow branches look great at weddings and could be just the item that will make your event, floral arrangement or craft project perfect. 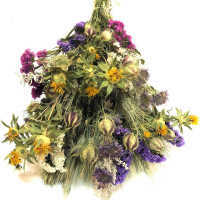 Case Option: Buy a full case of 12 curly willow bunches and Save More! 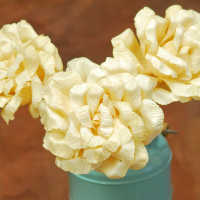 Curly Willow makes a fabulous addition to any floral arrangement, centerpiece, or craft project. These branches are naturally twisted and are quite flexible. 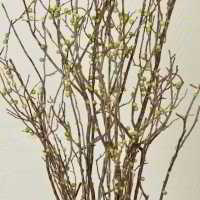 These versatile willow branches can be placed in floral frogs or styrofoam blocks in arrangements, or they can be tied or glued into place for whatever you are crafting. Dried willow branches can even be shaped for your specific needs. 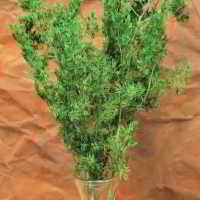 Simply soak the branches in warm water for a few hours until even the thickest portion of the stem becomes pliable. Then you can remove the willow branches from the water and gently bend them between your fingers to make your desired shape. 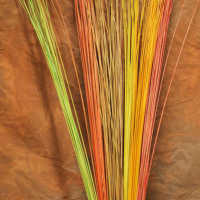 Allow the willow branches to dry thoroughly. 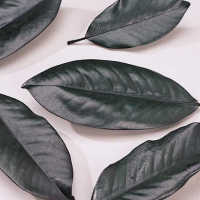 They will keep the form that you have made, making them a great medium for natural artwork and arrangements. 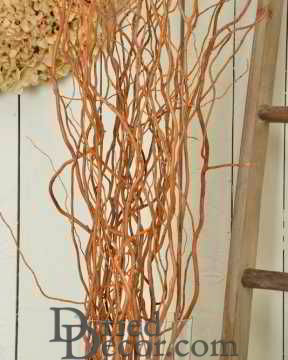 Curly Willow branches are often placed in a tall vase alone, making a stunning accent to a chic decorating style in any room of your house. Try placing a vase full of curly willow branches on a high shelf in your living room, with some of your favorite figures, sculptures or paintings. 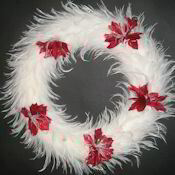 It is sure to add a dramatic flair to your home decor. Curly willow branches look great at weddings. A bride that we recently worked with arranged curly willow with artificial hibiscus flowers wired on at intervals in vases with fresh limes. These vases were placed on tables at an outdoor reception; another vase holding a candle was placed adjacent to the first. The effect was glamorous, yet simple. 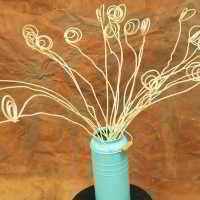 Curly willow could be just the item that will make your event, floral arrangement or craft project perfect. These curly willow branches are approximately three feet long bundles. 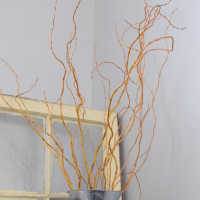 International note: We currently ship this curly willow branches to Canada and other international countries. It is your ultimate responsibility to confirm with your local customs if it will be accepted. Exactly what was shown and what I wanted. Fast shipping and great packaging. Perfect!! The curly willow is exactly what I was looking for. Would buy again. The willow branches was exactly what I was looking for. I am very satisfied with my purchase. 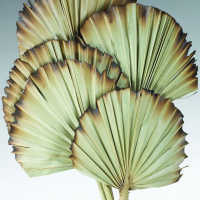 Dried Decor was exceptional throughout my ordering and delivery process! The product arrived faster than expected, it was packed so none of the fragile parts were broken, and it was exactly as described on the website. These are beautiful. Just what I was hoping for. Dramatic and gorgeous; the stems are a warm honey color. Easy to work with! I was nervous due to a wedding deadline I was working with. But CuriousCountryCreations got on it right away, and had the correct order sent out that same day. The arrangements were beautiful. Thanks to CCC and their suggestion of using the gold ting ting. Many compliments! Great company!! Very happy with the look of the twigs and all my friends ask me where I bought it... was very pleased with the products! Adds a nice rich decor to the room, love it! Quick Service! The branches are beautiful and looked great with my dendrobium orchids! I would highly recommend them. They were also the cheapest I could find! Very nice, look just like the pictures on the site. Truly 5 star products and service. Prompt delivery of the products! It is great to work with and looks good in arrangements. I will purchase this again. I am so glad that I found your website. 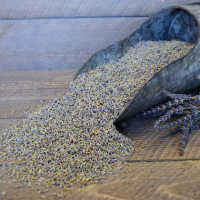 The materials in stores are usually broken from handling. Thanks! Just as described and pictured on webpage - good service and fast shipping. What I purchased works beautifully in my container in my living room. Beautiful,nicer than I expected.Look nice in my vase which I placed in my dining room. Thank you ,the service was great. Arrived in good condition but would have liked to see a little more in the bundles. Everything worked out in the end and the customer service was excellent. Very friendly and very accommodating. Quick delivery which worked out great for last minute deadlines. An overall good experience. Thank you! Great product for the money. Gives height in arrangements. These are quality products for a great price. I was very happy with this purchase. It was exactly what I was looking for. Thank you. Like the length of these curly willow. Were very nice when I called to check on my order. Good looking. Don't use much of it. Keep up the good effort. VERY ATTRACTIVE IN LARGE VASE SET ON THE FLOOR, LOOKS BEAUTIFUL. EXCELLENT! These are great for the overgrown look I want for my graduate thesis display. They are a little dusty and crumbly so beware when they arrive, but they are wrapped in open plastic so that helps. Affordable and a good resource. I thought each batch would be a bit fuller but it is pretty. My order was shipped really fast and the packaging was neat and done in a way to protect my items. Very nice pieces that worked as planned for some outdoor pots.